The MotionDrape LED is a backdrop for any mobile performer. 176 tri-color SMD LEDs matrixed across the 6.5ft by 9.8ft backdrop and can be controlled via the included controller or via DMX. This impressive display has 30 animated effects that range from color fades to a graphic equalizer effect. For added convenience the MotionDrape LED is grommeted around all sides to make hanging a breeze and is perfectly sized to fit on our CH-31 portable trussing system. 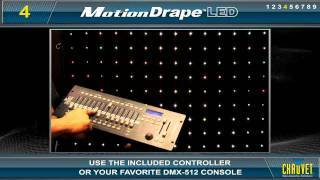 Considering purchasing the Chauvet Motion Drape? Have questions? Ask people who've recently bought one. Can i get replacement LED's from you? Yes you can, call our service guys on 01635 780002 and they will be able to sort you out. Do you own the Chauvet Motion Drape? Why not write a review based on your experience with it. Bought the Motion Drape and was delighted with the purchase. I've had other makes in the past but this really looks the part and will be a talking point for guests and party goers at your events. I wanted something bright and eye catching. This ticks these boxes. Previous drapes I've had were fastened to the poles with Velcro. I wondered if Chauvet's idea of using the re-useable tie-wraps would slow down the set-up time. In fact, I found the set-up time much the same as all you need to do is keep the tie-wraps looped through the holes in the cloth. Also you don't need to worry about any Velcro eventually losing it's grip as there is none.It takes minutes to hang. everything looks and feels good quality as you'd expect and comes in a good carry bag for storage. Worth the money. If you want good quality and to stand out from the rest then this is a good buy. Haven't hung the drape yet due to decorating the club but I have rolled it out on the floor, so I think it will be awesome. 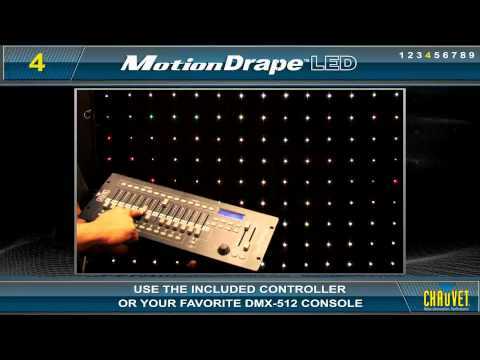 Seen a video for Chauvet Motion Drape online or have you own video? Check out Chauvet Motion Drape on DJkit.com!